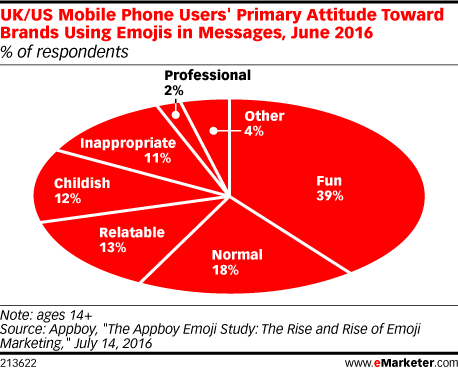 Data is from the July 2016 Appboy report titled "The Appboy Emoji Study: The Rise and Rise of Emoji Marketing." 540 UK/US mobile phone users ages 14+ (69% from the US and 31% from the UK) were surveyed online in June 2016. Additionally, Appboy analyzed data from 250 apps and 6 billion Android and iOS push and email messages sent during June 2015-June 2016. Appboy is a provider of mobile app engagement marketing services.